Canada's Brandon McBride shown competing at the 2017 IAAF World Championships. It took 10 years, but Canada finally has a new record holder in the 800m event. 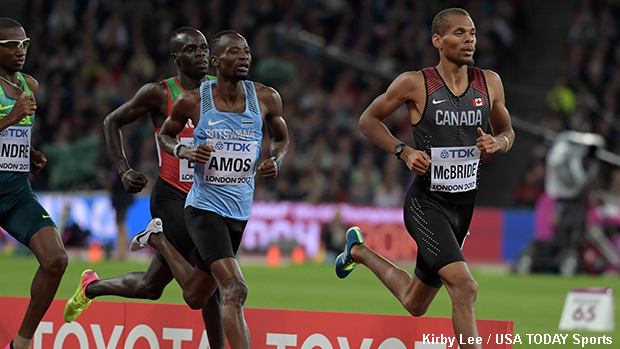 Windsor native, Brandon McBride posted an outstanding time of 1:43.20 on route to his second place finish at last week's Monaco Diamond League meet. His result represents an improvement over the country's previous top mark which was held by Gary Reed. Reed ran 1:43.68 at the same meet back in 2008. Shortly after his record setting performance, McBride expressed gratitude on his official Twitter page saying, "thank you to my inner circle, this would not be possible without them!" Brandon McBride, who was a stand-out for Mississippi State University prior to turning pro, rebounded in Monaco from a surprising second place finish at the Canadian Track and Field Championships earlier this month in Ottawa. There, he produced a time of 1:46.42 in the final where he was narrowly edged by Marco Arop (1:46.15). At just 24 years of age, McBride figures to be a major factor for Canada at international competitions for the long-term future.